Super powers, construction, hormones, timers, and selfies: This licensed game has it all. Marvel has its fingers in a lot of different iOS game genres, from fighting and LEGO-bashing to pinball, beat-‘em-up action, puzzle dueling, and collectible card battling. But Avengers Academy is something very different: A slow-paced, menu-driven city builder. Actually, you’ll build up a school campus, as the title suggests, but given the scale of the endeavor—including a sports stadium, jet landing pad, and clothing shop—it might as well be a metropolis. At least Marvel’s comic book spirit is put to good use here: While you’ll play for seconds at a time and then wait for timers to tick down, the legitimately funny and endearing dialogue pairs well with the reimagined teenage versions of these heroes and villains. 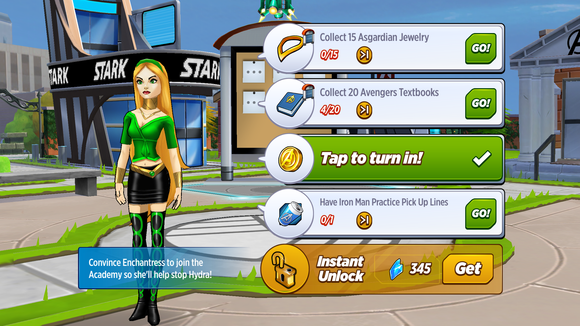 Avengers Academy is freemium to its core, yet so well-produced that the frustrations wither away. Well, a little bit. 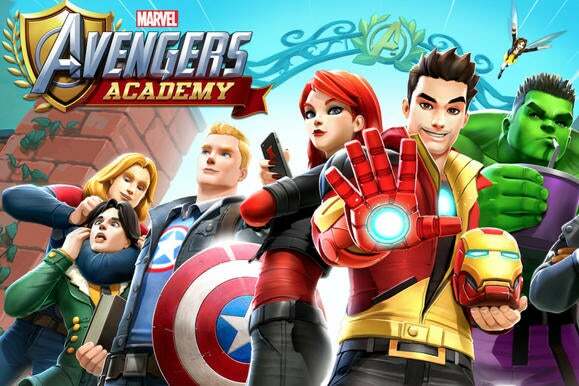 Essentially, Avengers Academy recasts the superhero team as the X-Men: They’re teenagers brought to this school to help harness their powers and learn to work together, all while navigating hormones, emotions, selfies, and social media. Only in this game, you’re not only helping them become heroes and become solid (super-powered) adults, but also building up the campus and its capabilities bit by bit. This is a very small corner of the overall campus, which expands gradually as events take place. And that means lots and lots of busywork. 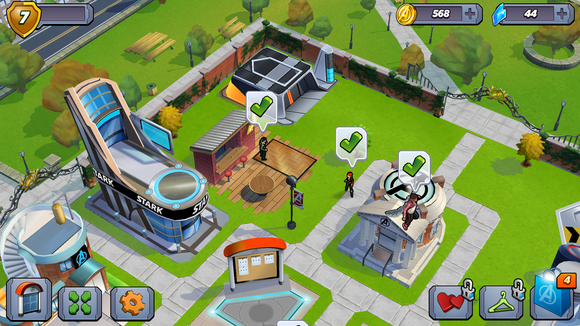 The job board in the center of the quad becomes your go-to destination, as you send Iron Man, Wasp, Black Widow, Falcon, and more on missions that either further a story cause or simply earn you a little bit of currency and inventory to level up buildings and characters. 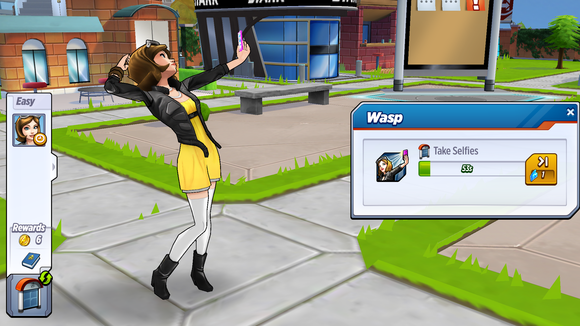 Maybe you’ll send Wasp off to pose for selfies for a minute, or send Iron Man to tinker with tech for an hour. Sometimes Loki needs to go dance for two hours. Why? Well, it doesn’t really matter: You always get coins at the end. Selfies to save the world? Hey, it’s important… to Wasp, at least. It’s a drag sometimes. Your gameplay session might consist of 30 seconds of tapping and dragging icons, and then having nothing to do for an hour or two (or eight)—unless you pay for currency to speed up those timers, of course. Thankfully, TinyCo really embraced the concept of turning these storied heroes into amusing teenagers, and there’s a surprising amount of wit here. Tony Stark is cocky but also has a heart of gold (or an Arc reactor), while Black Widow is an eye-rolling loner and Wasp is a bubbly, social butterfly—the adult versions we know well from the comics and movies translate well into teen archetypes, and the written dialogue is surprisingly funny and charming. Just consider playing with the sound off: The celebrity voice acting is overused and obnoxious, and I can’t stomach another Iron Man quip from Dave Franco. The character interactions are sharp and come across as genuine for teenaged versions of these iconic heroes and villains. As noted above, Avengers Academy’s biggest freemium sin is all the waiting: Every single action takes time to complete, and each character can only do one thing at a time. Many of the missions require actions from multiple heroes: For example, a shorter mission requires Iron Man to “Make a Scene” for three minutes, while Wasp must “Mess with Chemicals” for 30 minutes. In any case, your action is the same: You drag an icon across the screen and the character runs off and busies himself/herself for a while. Missions and hero unlocks happen over time, but the game always offers a way to pay for a quick out. There’s just nothing to do in the meantime, either—no mini-games or extra story content to dig into. You’re only chipping away at this slowly-progressing storyline and the gradual expansion of the potentially massive school for a minute or so, several times a day. 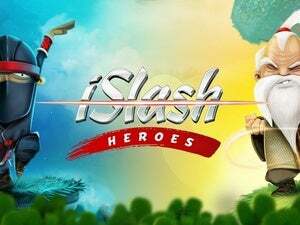 Given that, you might feel the itch to spend some money on coins or crystal shards, which speed up actions or let you purchase other heroes or buildings ahead of schedule. 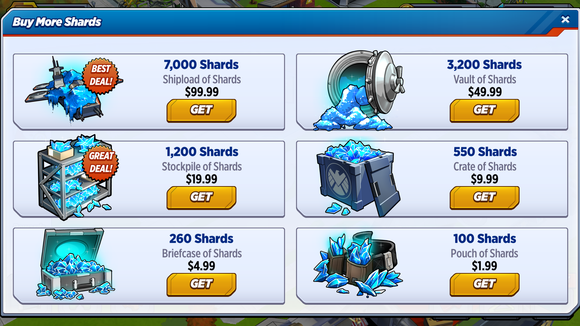 Shards and coins each come in a range of pack sizes and can help speed up all the waiting. Don’t do it. Buying either currency—sold in packs ranging from $2 to $100 each, respectively—doesn’t really enhance the gameplay or give you lots more to do. It simply makes things happen a little bit faster, but the things aren’t the fun here. It’s the game’s character and the gradual progress of the building routine. Playing for a moment on the bus or during lunch is a solid diversion, and you can play without paying if you have the tiniest bit of patience. 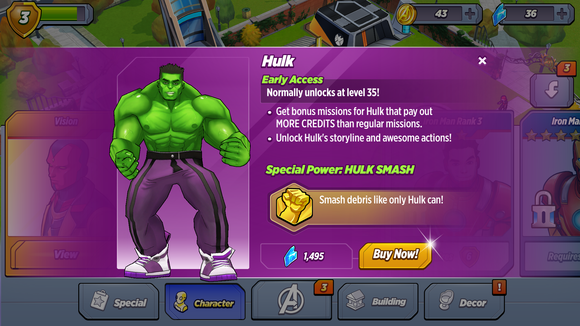 It will take you a very, very long time to unlock Hulk in the unpaid pacing—but about $25 worth of shards will open him up right now. Ultimately, I regretted spending money because I’d built a nice routine and made Avengers Academy part of my day for more than a week. I dropped $10 on a pack of coins, which let me add a new building, upgrade another, and spend big to speed up recruitment of a new character (Enchantress), but it really only saved me a day or two or playing. Now that I’ve broken the gradual routine, I don’t know if it will be quite the same. 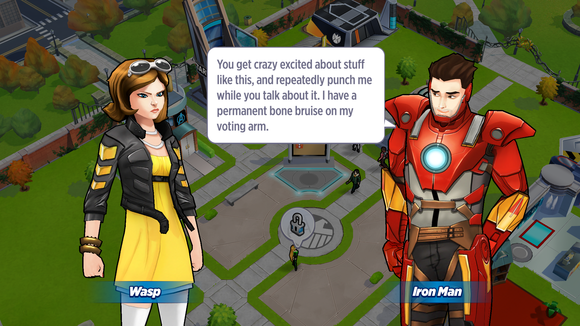 Marvel Avengers Academy may be vapid, but it’s attractively, engagingly vapid. This is a fun and mostly well-presented tweak on familiar characters, and that helps make a rote building experience solidly amusing. Also, you can enjoy it bit by bit without spending a thing, which is the way these games are best savored—and it really works here. Better yet, this is just the first release of Avengers Academy, and there’s more on the horizon: A dating component is promised via update, and based on the quality of the writing elsewhere, that element could help further differentiate this city-builder from the competition. With that ahead, this is one grind I think I’ll stick with.